A new transformer specialist in the Netherlands? Peter Vlaar founded his small company about a year ago and is getting more and more known by the Tube enthusiasts DIY-community. His company is named Vlaartronic and you can find him him at Vlaartronic.eu. I spotted him advertising at Marktplaats.nl, a NL Ebay enterprise. An email was sent and Peter responded quickly. 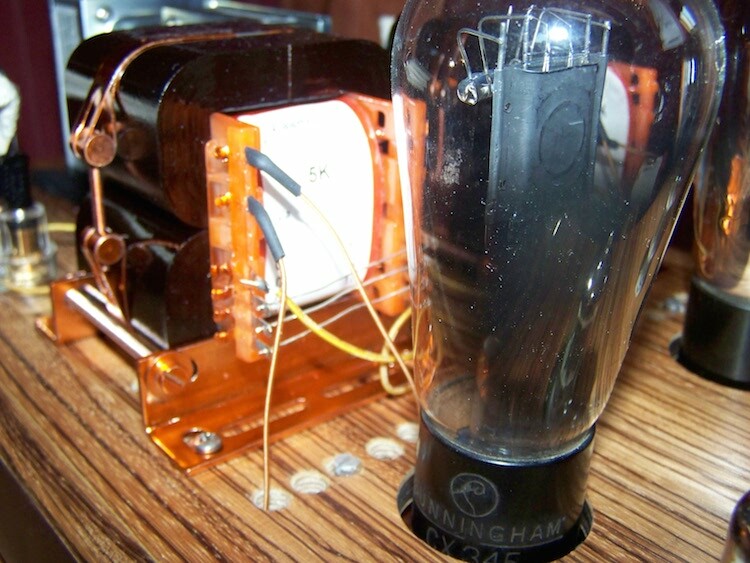 As I was just finishing of my SE45 amplifier he suggested to wind me a pair OPT's, 5K primary and 4 secondaries of 1ohm each. This allows for 4, 8 and 16ohm termination by putting these in series or parallel. Some weeks later the OPT's were ready for pick-up. C-cores are used with 0.05mm lamination and the windings reside on a plastic spool. With my handheld LCR-meter I can measure both inductance and impedance, be it without loading the transformer. However to my experience this will give some idea about the actual performance when put to load on the amplifier. 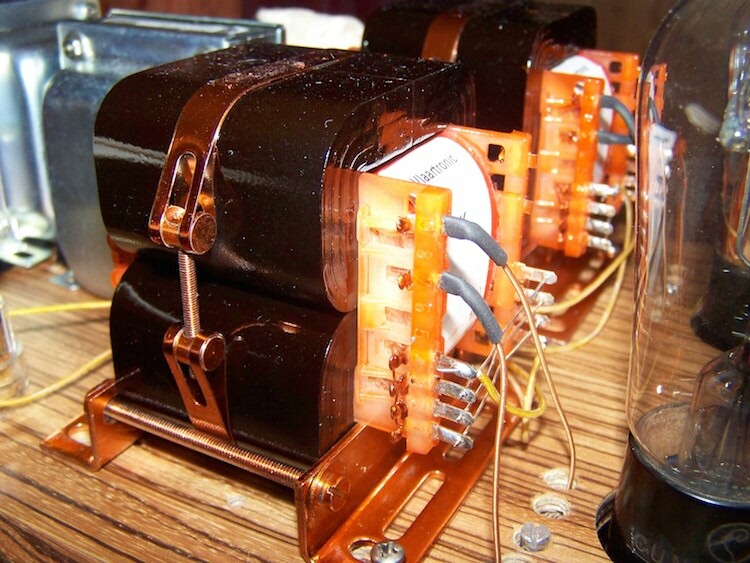 What I measured was an inductance of about 16 Henries, an impedance of 4K8 and a 137ohm dcR on the primary. Put to load in the amplifier, a '45 running 320Volts at 35mA, this resulted in a frequency response of -1dB at 10Hz and -3dB at 55Khz with a small resonance at 75Khz falling to 0dB at 180Khz. Power bandwith is restricted from 22Hz up to about 30Khz (got to get me a signal analyzer some day). The transformers have a red-ish finish due to the laquer used for impregnating, looking good and unique! So what is my subjective appreciation? Well, I do like them.. 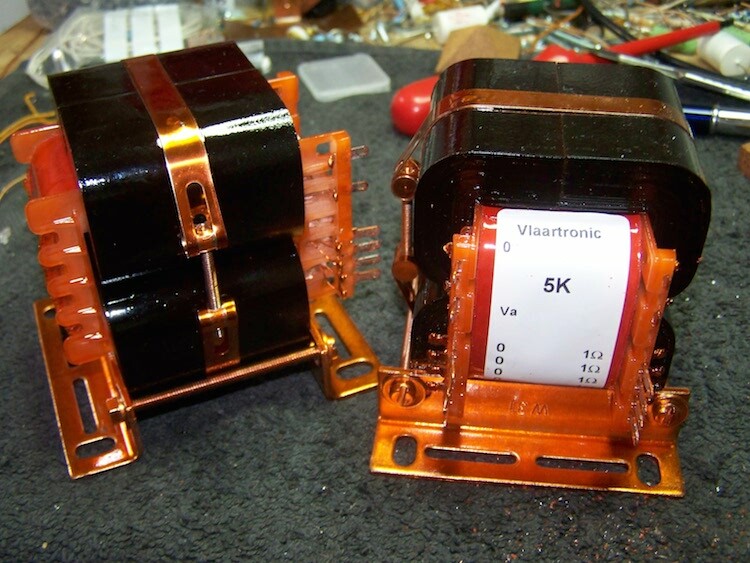 The Vlaartronic OPT's do what they are made for: Transforming the output from the '45 down to needs of the EMS-speaker. Due to the fine-laminated core material details are plenty and presented with ease, without being fatigue to the ears. Great! To my experience this is one of the most important key features overall for audio: Being able to listen for a long time without fatigue.. Actually this is maybe a good way to describe these OPT's: At first they will sound very much okay without any oooh's and aaah's, it is after some time that you get to appreciate these OPT's. Sound is certainly not laid-back or dull, it all just seems to be very "correct". I could not determine a certain aspect that distinguishes these OPT's from other (good) OPT's in terms of tone or typical aspects and that is to my opinion very positive. These OPT's should be considered when building your Single Ended amplifier in need of a 5K OPT. They perform at a high level (soundwise) and will not add some typical character to the music. For prices please contact Peter through his website. 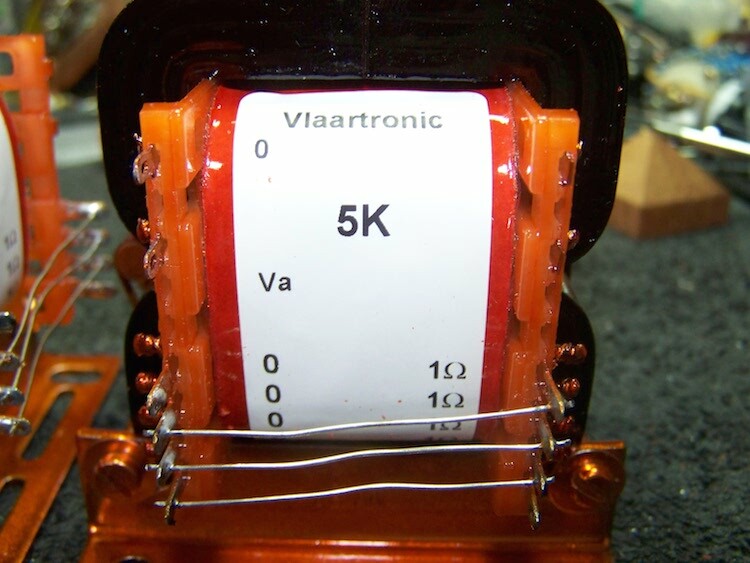 I have been using his power transformers for heating the '45's with good results as well, so I do think that Vlaartronic is an asset to the Transformer market! When discussing the somewhat limited power bandwith I suggested to Peter to make me some OPT's with more inductance and a lower dcR on the primary.. Curious about the difference, both objective and subjective, Peter agreed.. So to be continued..